A couple of weeks ago (Spet 29 – Oct 3) we had a 5 day holiday to celebrate the harvest festival of Chuseok, and Korea’s National Foundation Day. So, what better way to celebrate Korean holidays than with an American tradition: Roadtrip!!! After much debate, the three of us (Mike, Akasha, and Remi) set out to see the sites of the east. We had a few items we wanted to see and friends we wanted to visit, but no set agenda. Our goal was to drive a bit (about 3 hours a day), sleep on isolated pagodas, see northern and eastern Korea, hike mountains, go to the beach and see a few festivals. We did it and it was by far, one of our best vacations ever! Day 1 This was a Friday, so we had to work till 5 pm, at which point we finished packing the car, grabbed a quick dinner at the local Kimbop Nara and hit the road at 6! We went a bit north first, and traffic was good until we got to Gwangju, where we hit some serious Chuseok traffic. Chuseok traffic can be paralyzing, turning two hour drives into nine-hour odysseys, but for the most part, we got lucky. 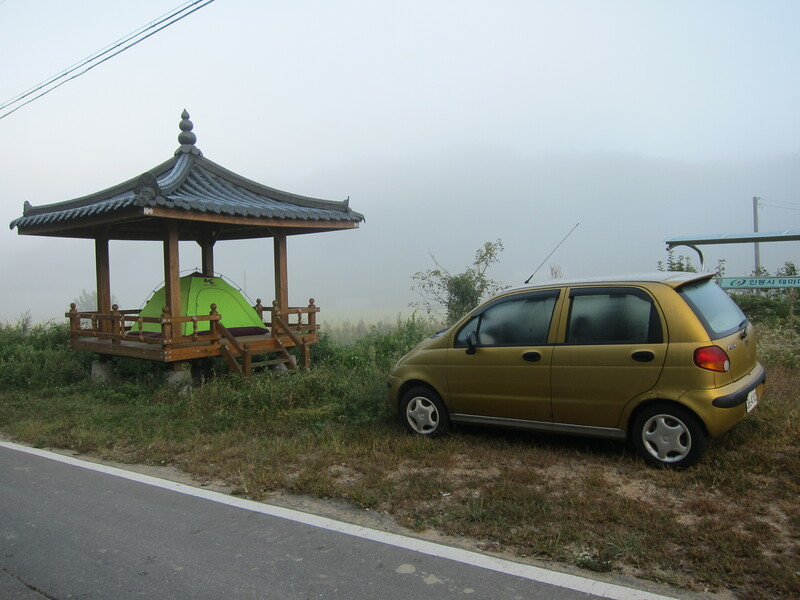 A few minutes past Gwangu, we found our dream pagoda just around a sharp bend on a mountain road not far from the small town off of Namwon. It was around 9:30, and even in the dark it was obvious that we were going to wake up to a beautiful view of Jirisan. We slept with the moonlight pouring through the tent. Day 2 We woke up to a beautiful view of the valley leading to Jirisan national park. After rousing ourselves, we hiked for an hour giving Remi a stretch before heading out on the road. 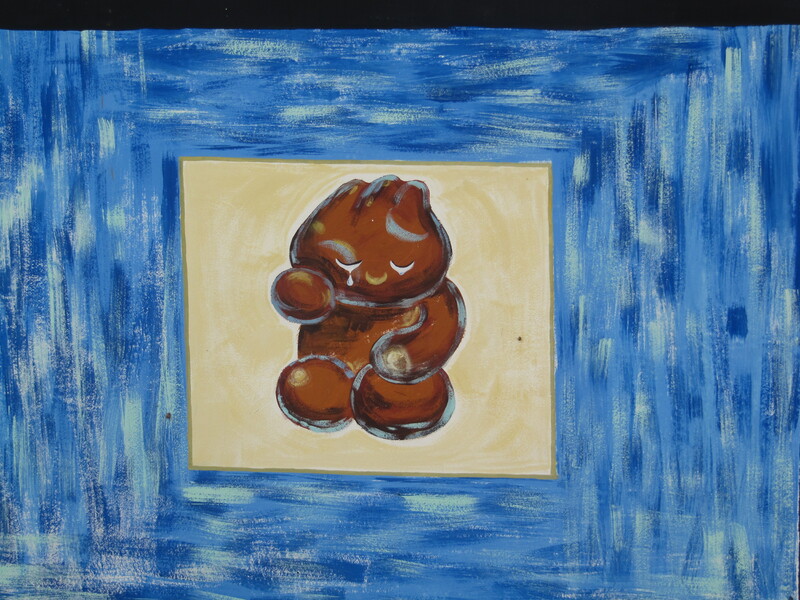 We didn’t get very far because I (Akasha) was beckoned by a mural of my favorite Korean children’s book, Puppy Poo. The first mural panel of my favorite Korean children’s book. We walked along the streeets of Udang, also known as ‘the cutest town ever.’ It was covered in murals. We poked into someone’s home business, watched them make rice cakes, and snuck pictures of their garden. Then we pushed on till we stumbled on to a nice little farmer’s market. Here we found whole fried chickens, sompyeong candy (a Chuseok specialty) and fish, fish, fish. Finally, just past noon, we found a landmark that was on the map: Haeinsa Temple, one of the oldest and most important Buddhist temples in Korea. 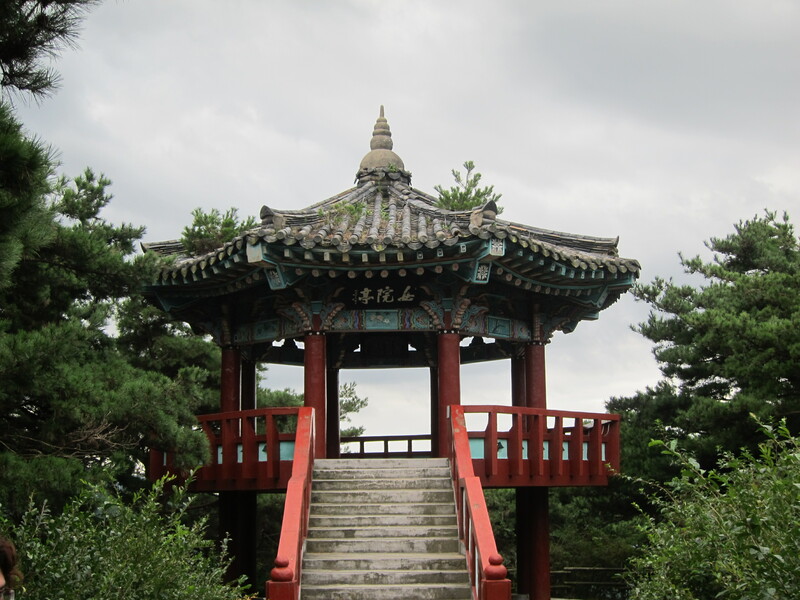 Nestled among the peaks of the Gaya mountains, Haeinsa was founded in 802 by two Chinese brothers. 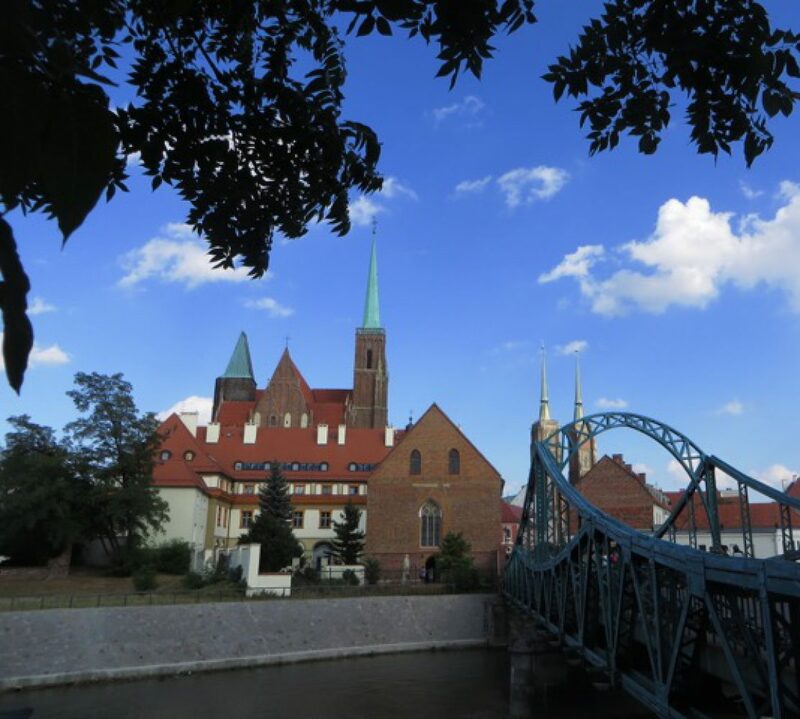 There are over ninety buildings on several levels, which makes for peaceful walking and beautiful views. 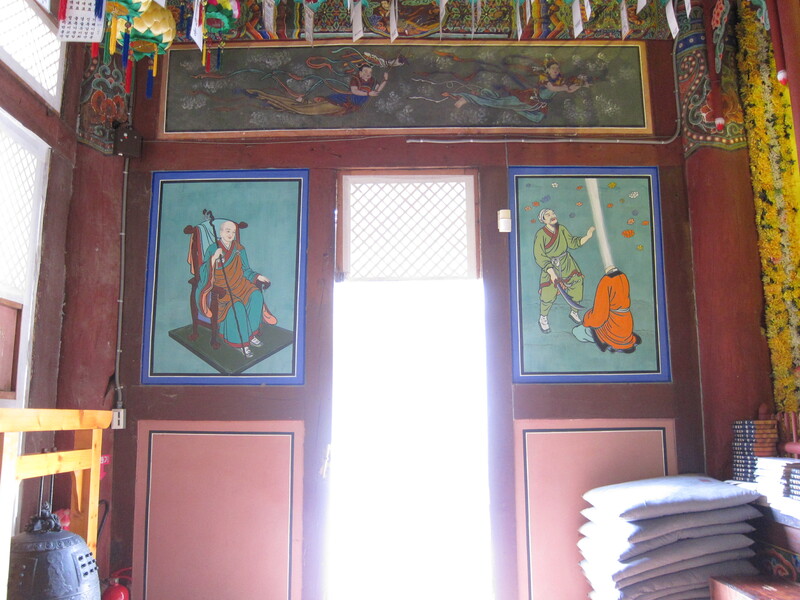 It also has the Koreana Triptika, a collection of several thousand wood blocks that make up an entire set of Buddhist scriptures. It is a UNESCO World Heritage site and amazing. We weren’t allowed to take pictures, but we did get a print. Finally, we met our friend Lisa in Andong, saw a bit of the festival, and had a dinner of Kim Chi Chi Ge. Then we drove out of town to find a nice pagoda by the reservoir. It was a beautiful campsite, but the night was cold. 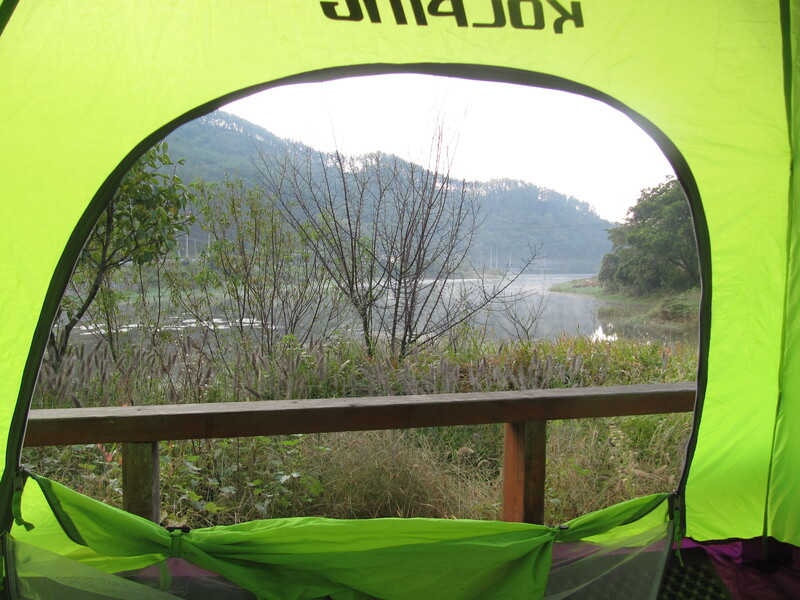 Day 3 Once again we awoke to a beautiful morning, dripping in dew, the mountain valley cloaked in fog. We broke camp, fed the hound, and went into town to meet Lisa for some coffee at a great cafe in her neighborhood. Next we went to the Andong Mask Festival. Andong has the reputation of being a very traditionally Korean city, and Mask dances are part of Korea’s traditional entertainment. They have also expanded the festival to include international dancers and masks, so there’s a lot of cultural knowledge there. There’s also tons of food and activities (like eating shwarma!). We met up with some of our friends. Akasha and friends made a mask in one of the tents, and then we visited a booth that had traditional wedding garments. 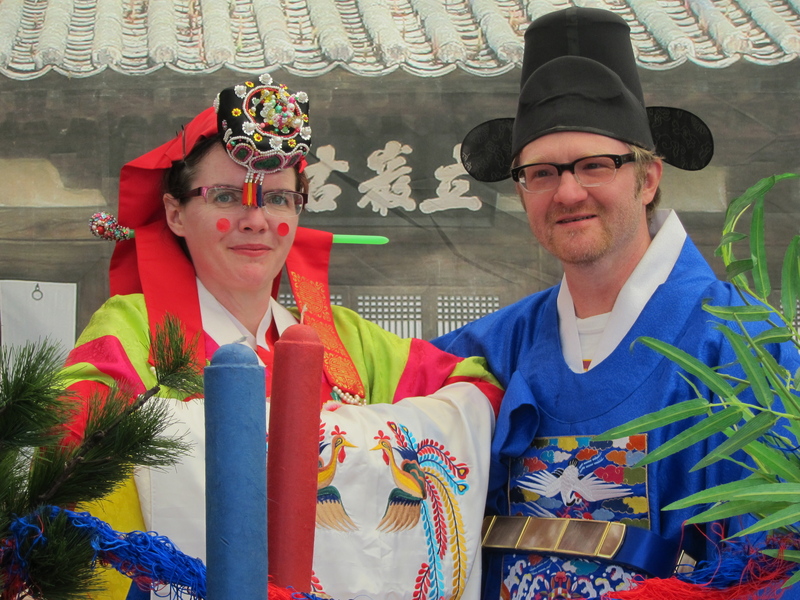 Here, they dressed us up in hanboks. Mine (Mike’s) was a simple affair, but Akasha had to dress in about four layers, which took almost ten minutes. Finally, they took our picture as if we were being married in the traditional Korean way, which involves bowing to each other, handing over chickens, kissing with dates, and numerous stiff formal poses. It would have been very romantic, if not for the dozens of Koreans crowding around the booth, all very amused to see a couple of foreigners being dressed for a wedding. After leaving the festival, we drove across the mountains to the coast of the East Sea (internationally known as the Sea of Japan). 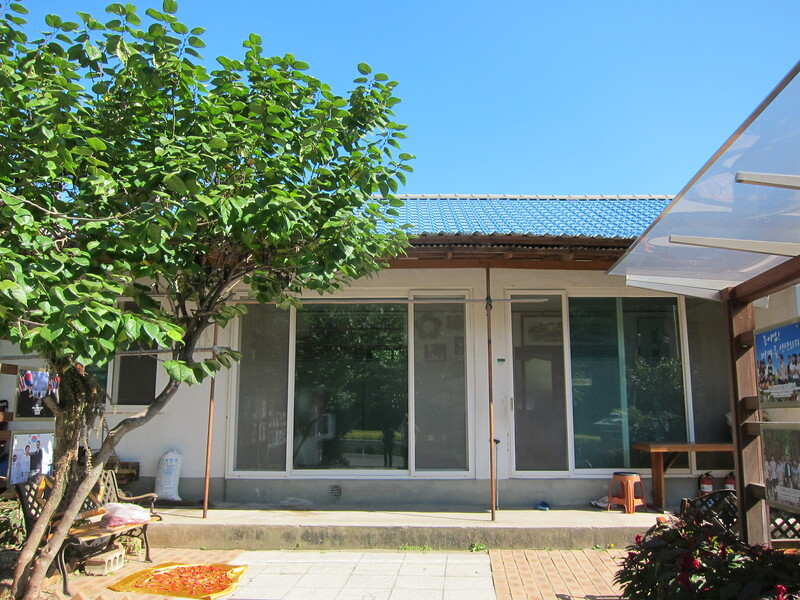 We drove carefully through the narrow streets of some seaside towns, not finding any pagodas, until we found a campsite that had beautiful cabins for rent. Akasha met up with a principal from Daegu’s Dongbu Elementary School, who was incredibly helpful in booking us a cabin. She also insisted we come to her cabin for dinner, where we met her husband, daughter and son, and her grandchildren. Our own cabin was an amazing furnished two story beauty just feet from the shore, and we slept well on the ondol (heated floor) bedding. Day 4 In the morning we watched the sun rise over the ocean and enjoyed the amazing view. 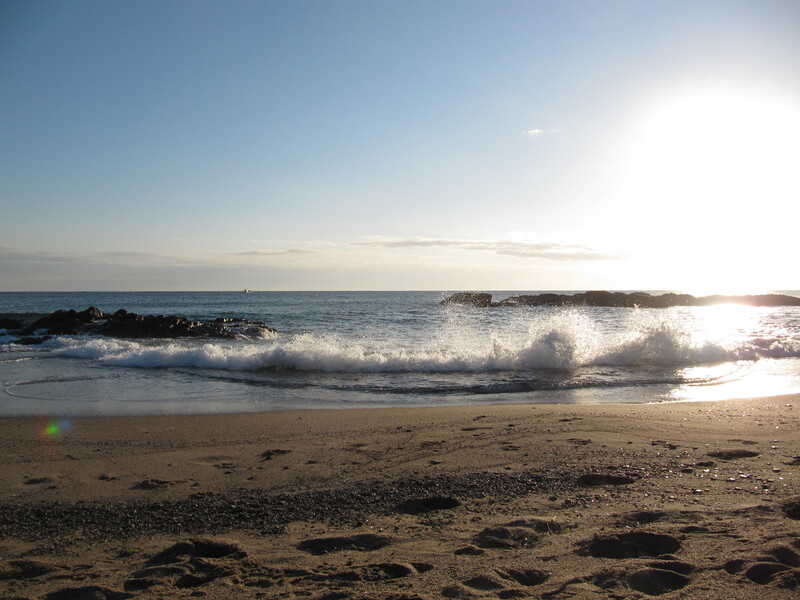 Our road trip goal of the day was simple: The furthest point East on mainland South Korea. (Hey, we’d already been to the southernmost point.) Along the way, we impulse stopped at whatever looked interesting, and this morning we discovered a gem: The boyhood home of Korea’s current president, Li Myung-bak. Li was actually born in Japan during the occupation, but after the war he came here to Deokseong-ri for part of his boyhood. They are very proud of Mr. Li here, and have put up several biographical plaques that extoll his hard work, intelligence, and determination. We pushed on to Homigot, the easternmost point of Korea. We walked along the port and ate sashimi on the pebble beach. Our next goal was Jinju and we decided to take a twisty county road instead of the straight expressway. It was a beautiful twisty drive between mountains following a river to a dam. It took a really long time and was inspiring. My favorite rest stop included an ancient ice house, which was a large mound covering a place where they stored the ice below ground. It had access to the creek to keep it cool and let it drain. It reminded me (Akasha, of course) of the episode of Little House on the Prairie where Belinda gets locked in the ice house. After hours of driving we stopped by the Jinju Lantern Festival, commemorating a battle in the Imjin War. This festival was amazing, hands down one of the biggest, most ambitioius festivals we’ve been to. The entire riverfront was lined with giant paper lanterns, and more lanterns were moored in the river. 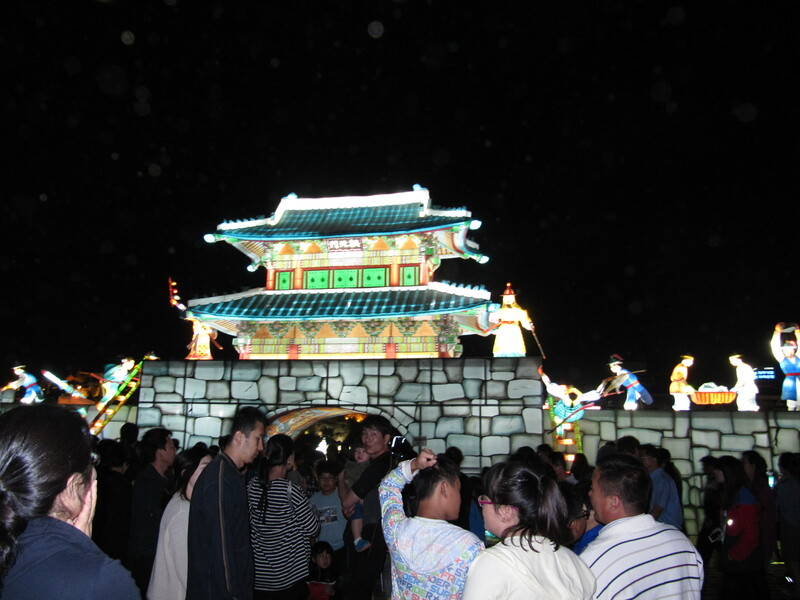 The fortress on the hill was decorated with hundreds more lanterns of people in every possible activity: skating, playing games, getting married, or carrying the emperor, for example. At 8:00 there was a fireworks show, the loudest and closest to the grounds any of us had ever seen. Then we had dinner, strolled through the high school’s ‘wish tunnel,’ and by 11:00 we had to force ourselves to get in the car and go look for a pagoda. Picking a pagoda late at night can be an adventure. It took us a while to get out of town, and even longer to find a nice quiet pagoda, and in the end we weren’t too picky, but did find a nice place in another valley by a lake. At first we thought it would be a nice, quiet night like the other pagoda, but then the dogs started barking. One dog started, then another, and soon their barks were echoing up one side of the valley and down the other echoing over the lake, and we realized there would be no sleep that night. It even got a little bit scary, and Remi was anxious with all the noise, and then there was a strange rustling/flopping sound in the grass around the pagoda. So we got out of the tent, ran like scared teenage girls into the car, drove down the road, and napped closer to town until dawn. We woke up in the car and drove back to break down the tent. 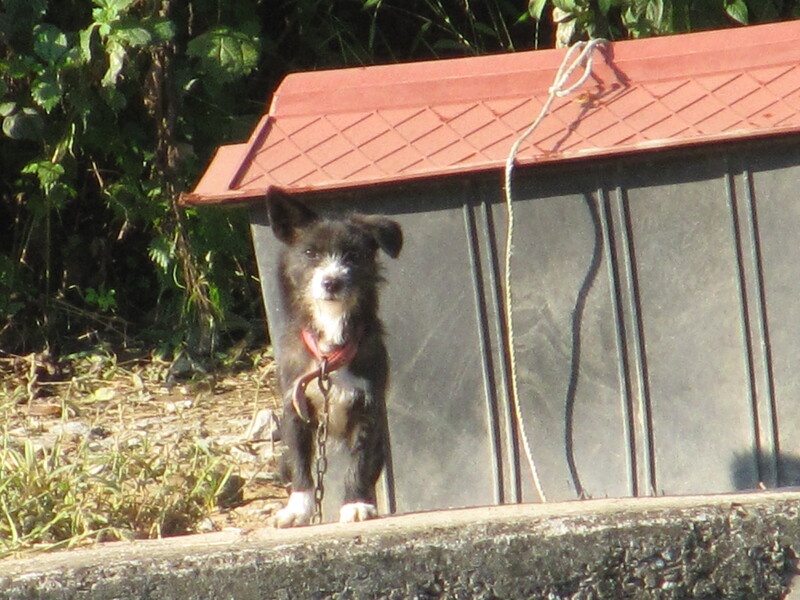 We soon discovered that our scary sound maker (ie: ghost) was the world’s cutest puppy who had escaped his collar, and his owner was one of the friendliest Ajjumas (older ladies) we have met in Korea. Nothing like the light of day for a little perspective. Our goal for the day was to Oktoberfest at the German village in Namhae. Along the way we drove down to Sacheon, a gorgeous coastal-village, and stopped for breakfast. 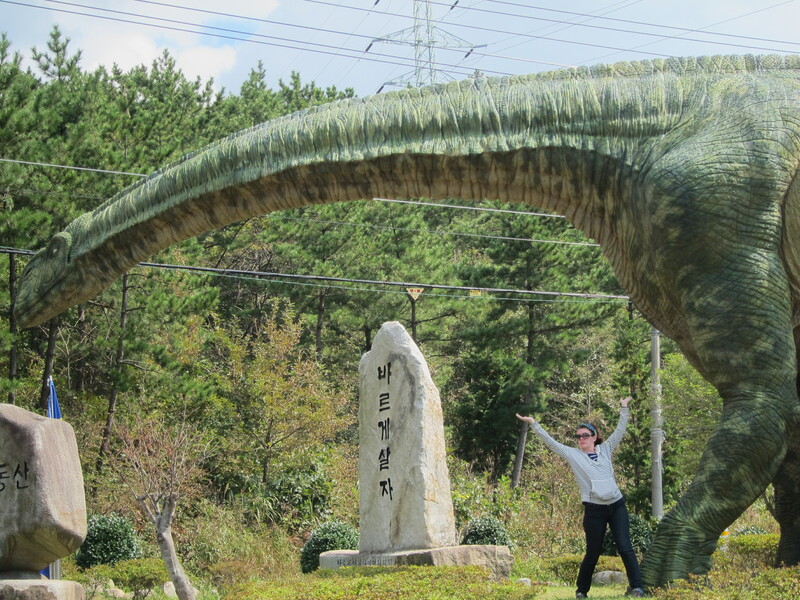 We took a series of side trips as we jigged and zagged our way to Goseong, home of the Dinosaur Museum and the World’s Dinosaur Expo. We crossed over the bridge connecting Sacheon to Namhae on our way to the Namhae Oktoberfest. I set my hopes too high for the Oktoberfest. We had hoped for lederhosen, spaetzle, and polkas. But there was only one brand of German beer. There was one very dry sausage with some yellow mustard. There was a lot of Korean food, especially dried squid. There was also a LOT of Korean music. We only heard Korean spoken and only heard Korean music. “Gangnam Style,” the current uber-hit overplayed everywhere in Korea (and around the world, we hear), was played repeatedly, to the exasperation of those who came for some good German fun and were dying for a Beer Barrel Polka. Heck, I would have settled for an Edelweiss, which my elementary kids play on the recorder. 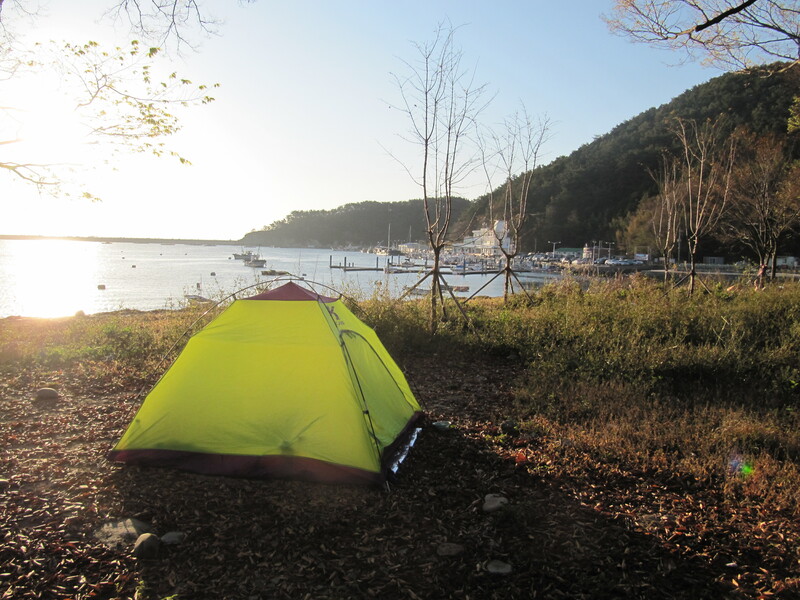 We spent the night in Namhae, on the beach, with a campfire. It was fantastic. We shared a campfire with a sweet Korean couple from Busan who came down for the beer. It was a beautiful pebble beach with a cute tribute to the wind breaks we were camping in and how windbreaks protect villages. It was a beautiful night for sleeping, a bright moon, clear skies, waves lapping the shore, and crickets singing. Day 6 Our only plan was to have fun driving home. In the morning we discovered the marina where we camped was beautiful and has an amazing little cafe. We indulged with another waffle breakfast and coffee. Mike saved several dying starfish that were drying on the dock (that Remi would like to have eaten.) We poked along Namhae’s scenic coastal drive for an hour. We had hoped to do more exploring, but I think we were explored out, so we jumped on the express way and were home by 3 for laundry and a nap. It was a long 6 days. It was an amazing 6 days. I’d love to do it all over again!